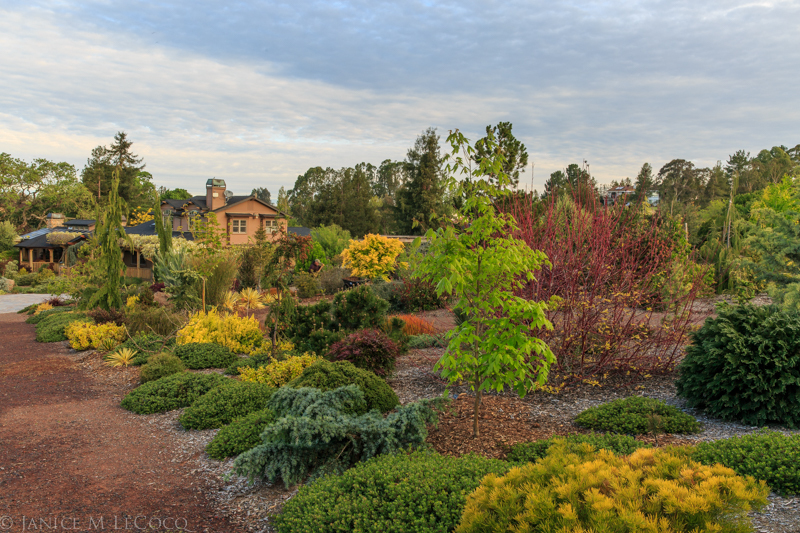 In spring the go-to colors are pastels, and the foliage garden certainly has its share of baby blues and soft yellows. However, they often share the garden space with deep, grown-up purple, which contrasts richly with the softer hues. Colorado blue spruce cultivars (Picea pungens cv.) are the quintessential powder blue foliage plants. When paired with other pastels, they have a demure persona, belying the strength inherent in their tough, spiky needles. Around purple, however, the blue acquires a steely note. Purple works well as a background color, especially if you want the background to be, well, in back. Lighter colors draw the eye, darker ones recede. A purple background allows the plants in front to claim the attention. The Eucalyptus in the shot above is about as pastel as it gets, yet takes on a more sophisticated mien when backed by smoky Cotinus x ‘Grace’. Cercis canadensis ‘Forest Pansy’ is a lovely, if somewhat awkwardly shaped, small tree. Here it is planted behind a grouping of different shades of blues and greens and serves as a backdrop which adds richness to the scene and disguises its lanky branching. Succulents are a good place to look for ‘evergreen’ purples; the Mangave above is another great companion for blue spruce. Not only do the colors provide fabulous contrast but the strappy leaves of the Mangave are a wonderful foil for the spruce’s small needles. And in true F&F fashion, these plants do the job all 12 months of the year. For a stained glass effect, mix purple with other saturated tones such as the greens and yellows pictured above. Paired with the yellow the purple warms up and creates deep contrast to the other colors. There are many grass-like plants (and even some true grasses) that add purple to the garden. The Cordyline ‘Design-a-Line Burgundy’ in the photo above adds depth and flair to what would otherwise be a colorful but flat combination, and, like the Libertia peregrinans (the orange grass) and the blue spruce and holly, holds its leaves all year. Many Phormium come in shades of purple and for those that don’t mind the maintenance, there are several Pennisetum cultivars in deep purple tones. Colors work best when they are not isolated; don’t hesitate to echo the tones throughout the garden. If you look carefully at the above photo you will also see a bit of purple in the far back about 3/4 of the way across the photo, as well as some purple tones on the plant in the immediate middle front. Apparently the colors ‘Blue’ and ‘Black’ sell better than the color purple. There are many plants sold as blue or black that are really purple, such as the Sambucus (elderberry) above. Remember, when selecting your plants, go by what the foliage looks like, not what the label promises. This Sambucus is deep wine-purple, and can be grown as a large shrub or limed up to make a small tree. Purple gets more subtle in plants with two-toned leaves like the ‘Plum Hussey’ mirror plant. 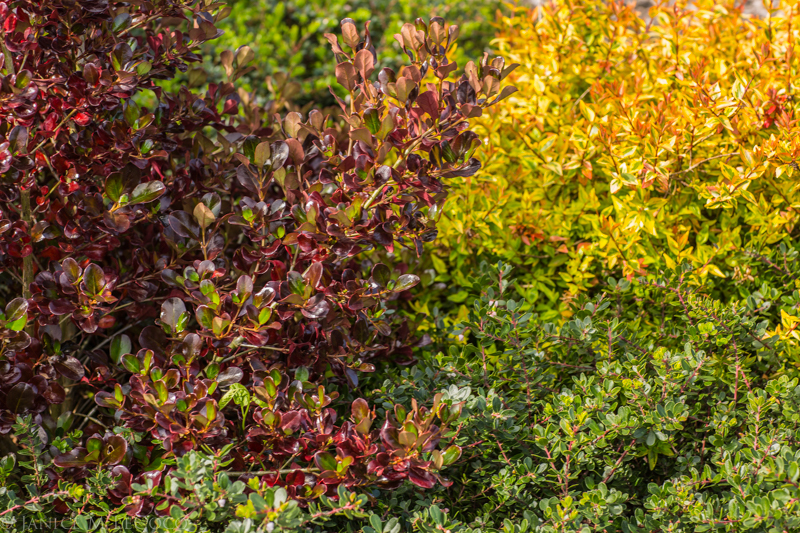 This cultivar of the New Zealand Coprosma leafs out bright green and the older leaves take on purple-tinged edges until the cold weather comes and drenches them in a deep, plummy coat. You can see Cotinus x ‘Grace’ in the background, striking, as befitting, a grace note. We can’t seem to stop pairing our purples with light blue, can we? The genus Fagus, or beech, is another good place to go purple-hunting. In the shot above the tones of the large Cordyline in the back are picked up and carried forward by the glossy purple beech. The Yucca ‘Blue Boy’ (really purple, but that didn’t make for the alliterative name) in the lower right hand corner continues the theme. Beech trees (Fagus sp.) are welcome additions to gardens that are climate-appropriate because of not only their beautifully colored and textured leaves–at once both glossy and fuzzy–but also their elegant, silky bark which graces the winter landscape. They do best in spots with ample rainfall but once established will manage fine in even mild Mediterranean climates with little more water than some of the drought-hardy standbys. Purple doesn’t have to be bold or strident; there are many plants with purple leaf edges or undersides, like Hebe ‘Amy’ in the photo above. ‘Amy’ also has purple flowers, but they are ephemeral. The leaves and stems are purple all year long. For real subtlety, treat purple as an ornament, the way that one might wear an amethyst ring or a garnet brooch. The cones on the ‘Poulsen’ fir are luscious, deep purple and decorate the shrub for months in spring and early summer. Categories: Circle Oak Gardens, Close ups, Color combinations, Cones, Purple | Tags: best foliage plants, blue spruce, conifers, evergreen shrubs, foliage color combinations, foliage gardening, purple plants, smoke bush | Permalink. Our posts have always had their inspiration in Sara’s garden. The concept of ‘form and foliage’ comes from her particular gardening focus. Jan attempts to capture this concept and as she has become more familiar with both the garden and her craft, she has had more of a tendency to go rogue and resist direction. Thus, we bring you some of her favorite images, unrestrained by Sara’s prejudices or guidance. Her comments follow. Every photographer interprets light and color in their own way, and photographers develop a style or a ‘way of seeing’ that they present in their photographs. Sara wants the photographs to ‘look real’, i.e. the way SHE sees the scene. My reality is not always the same as hers. The phenomenon of ‘digital darkroom’ technology provides so many tempting opportunities to play with images and take them beyond what the eye sees. The Agave above is a good example, tuned up with Trey Ratcliffe’s Aurora HDR (Macphun) and Adobe Lightroom software. I’m always fascinated by color repetition, which leads the viewer’s eye through the scene. One of the photographers who has inspired me is Dewitt Jones. He doesn’t go out capturing images, he waits for the images to capture him. The above shot caught me due to the wonderful repetition of the steely blues in the Mexican pebbles, the succulent, the copper top of the lamp and the spruce in the distance, all complemented by the vivid red and green. This is an exquisite plant with soft colors, enhanced by the bejeweling water droplets. Close-up photography is challenging, because composing an image with the right “depth of field” (how sharp the image is throughout) is very challenging. In this case, I want to capture the delicate shape and coloration of the foliage while keeping it in the context of the overall characteristic of the plant: an explosion of clouds of needles in shades of burgundy, mauve and pink. I strive to have just enough background to give context without overpowering the delicate subject. Our objective on this day was to photograph yellows and blues, both in landscape shots and close ups. I am always attracted to spider webs, because they demonstrate that the garden is teeming with life, much of it hidden. This ladder-like structure is particularly distinctive. Sara wanted a photo of her favorite palm tree. She was startled when this is what I produced. Sara expected a shot of the graceful blue-gray fronds that fan out over the succulent garden. When I went out to shoot the plant, I found myself fascinated with the yellow teeth along the stems and the fibrous trunk. I ignored the fronds and focused on what spoke to me. It took her a while to understand what I saw. This image now hangs in her home, because the plant took on an additional dimension for her once she understood my perspective. The Mexican blue fan palm provides a fantastic opportunity for a classic graphic image. I threw Sara a bone and focused on the leaves. Once again, I produced a different image than the one she expected. I was struck by the color and the steely structure. The pleats emanate from the stem dynamically, creating a sense of movement that I could not ignore. The imperfections make it more interesting. I’m really drawn to agaves because of their structure and their prehistoric aspects. This agave hybrid is particularly compelling, and I love the explosion of the lime green from the center to the mottled leaves. If you’re any good at photography, you’ve learned early that you need to go beyond what first captured your attention and seek alternative views. The colors of the mangave are echoed in the colors of the restio, giving the image integrity and continuity. The image is strengthened by the contrast between the broad, strappy leaves of the mangave and the wispy, threadlike stems of the restio, capped with the burgundy seedheads. I recently got an ‘infrared kit’. I love the way shooting in infrared reveals aspects of the image that conventional photography does not. If the palm shot nonplussed Sara, what do you think this one will do? Stay tuned…. Categories: Circle Oak Gardens, Close ups, Color combinations, garden photography, Winter | Tags: foliage color combinations, foliage gardening, garden photography | Permalink. The garden blogs and magazines are full of photographs of spring flowers as much of the country says farewell to a brutal winter. It’s no coincidence that many of these are macro shots, as the flowers are often a small part of the overall landscape this early in the season. If you’re a foliage gardener, however, you can get out your wide-angle lens and snap away, almost indiscriminately. The colors assail you from every part of the spectrum: yellows, blues, maroon, orange, red, bronze and of course, green. In the photo above, the Spirea does look like it is on fire, giving credence to its name of ‘Goldflame’. At this time of year, texture and form take a back seat, as the colors are bright enough to leave afterimages on the retina. The fiery yellows and oranges are complemented by the richness of the greens and reds, while blue strikes a soothing note. The spring colors are also borne by evergreen shrubs, which perk up and shine with the stronger sunlight and longer days. The trio in the photo above are all evergreen; they carried the garden interest through the winter and now aren’t about to be outshined by their deciduous neighbors. Some of the evergreens seem to spring to life as the deciduous shrubs and trees nearby leaf out. 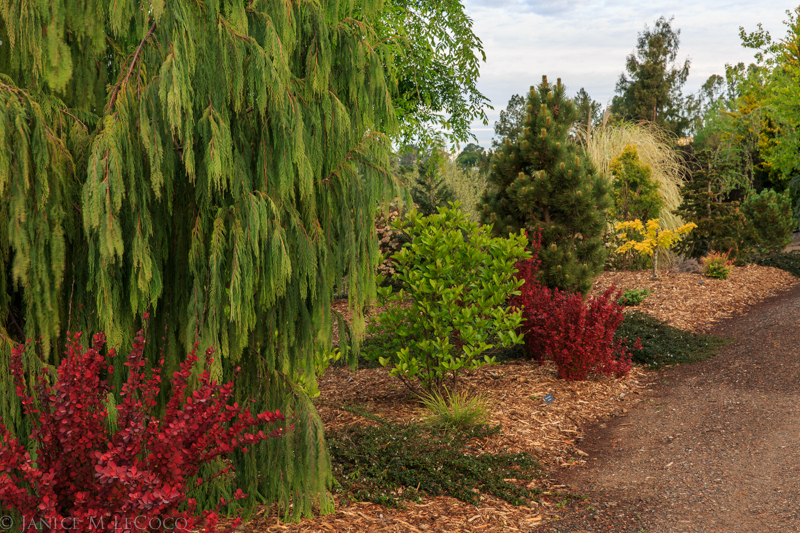 The soft, deep green conifers provide the perfect backdrop for the red and yellow of the barberry and oak. 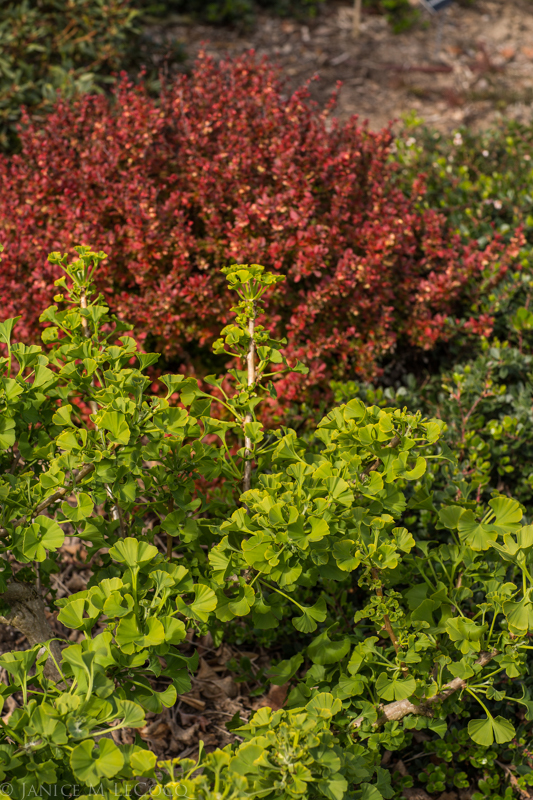 Even the dark foliage has a richness in spring, especially when repeated throughout the border. 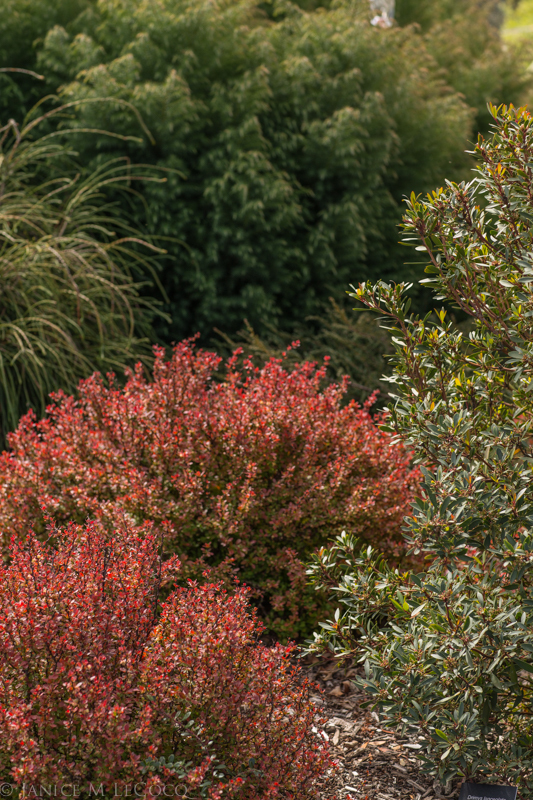 The Leptospermum, Coprosma and Cordyline are drenched in the same deep burgundy, which provides the perfect anchor for the yellow, blue and orange. Green, as always, is the unifying theme. 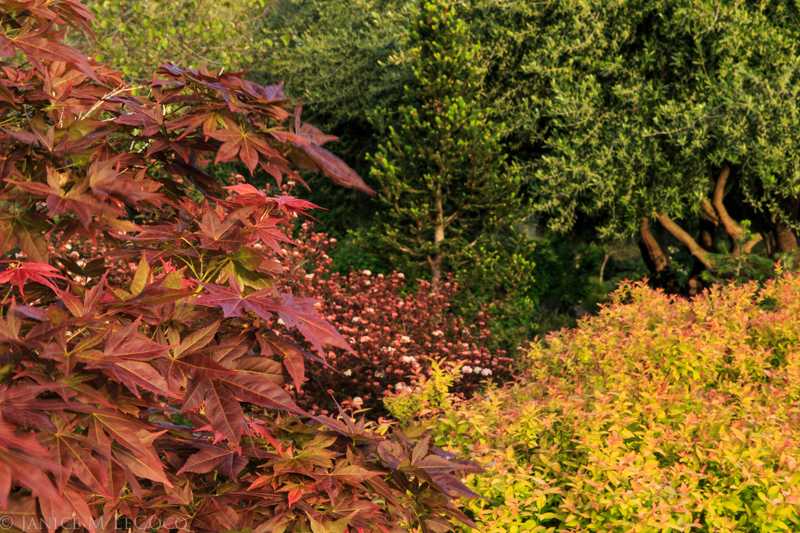 The burgundy of the Loropetalum in the photo above provides the same contrast to the greens and yellows and the orange of the maple (Acer palmatum ‘Villa Taranto) just leafing out on the right. In the photo above we see the Spirea, Physocarpus and Acer ‘Iijima Sunago’ again from another angle. The oranges and reds are made even brighter when contrasted with the blue of the cedars over the door and the seed pods of the redbud in the foreground pay homage to the maples’ fiery tones. Green and red are color wheel opposites and make dramatic combinations. This pair of deciduous hardwoods slumbered through the winter unnoticed until they burst into attention-grabbing foliage in spring. The ‘Admiration’ barberry has evergreen neighbors on its other side, and when it leafs out in its red glory it brings out the crimson stems of the Drimys lanceolata on the right and the bronze tones of the Thuja plicata ‘Whipcord’ and Cryptomeria japonica ‘Elegans Compacta behind. Yellows, like all light colors, draw the eye and liven the landscape. 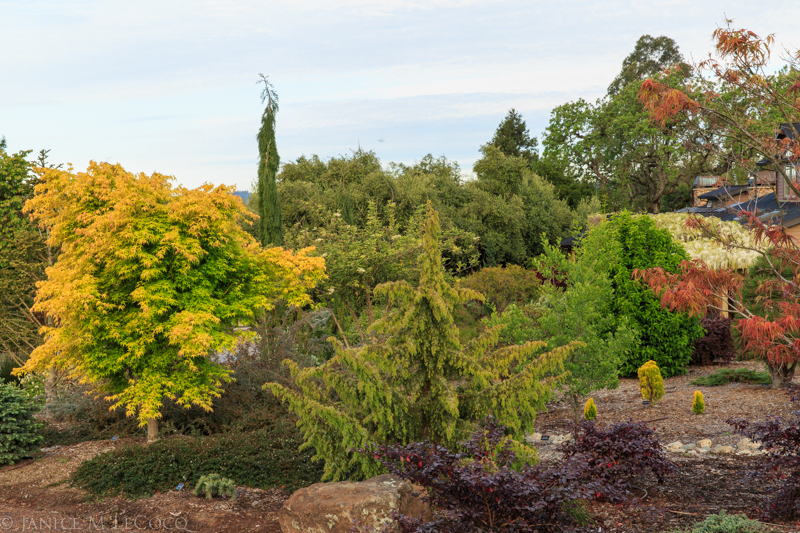 Yellows are represented above by Abelia ‘Kaleidoscope’, Euonymus ‘Emerald ‘n Gold’, Yucca ‘Walbristar, Acer palmatum ‘Mizuho Beni’ and even the light green foliage of the Banksia in the foreground. A softer blue note is provided by Cedrus deodara ‘Prostrate Beauty’. The other side of the path has a similar theme, but the Euonymus is joined by Phormium ‘Golden Ray’ and the blue is provided by Picea pungens ‘Lucretia’ and Agave ‘Blue Glow’. From the other angle, burgundy plays a much more significant role, and the blue of the plants is echoed in the ceramic pots around the folly. The brighter colors draw the eye, but there is also beauty in the softness of groupings of colors that are next to each other on the color wheel, termed analogous combinations. The Cedrus, Arctostaphylos and Banksia provide repose from the incendiary foliage around them. While structure is not as obvious when bold color abounds, it can’t be ignored! Categories: Circle Oak Gardens, Color combinations, Color Palette, Spring | Tags: color wheel, conifers, foliage color combinations, foliage gardening, garden photography, japanese maples, plant selection, succulents, woody shrubs | Permalink. Jan goes native; trades pines for palms…at least for a week! Jan just returned from Molokai where she attended the “See the Light” seminar run by Dewitt Jones, Rikki Cooke and Jonathan Kingston, three fabulous photographers whose professional lives all have passed through National Geographic at some point and whose breadth of experience and approach to photography are rich and inspiring. It would take pages to describe this course, but suffice it to say that she learned a lot, not only from this dynamic trio but also from their equally talented wives and the other course attendees. Form and foliage, Island-style. Aloes and bromeliads combine for fantastic effect. She wanted to share a few “form and foliage” images from Molokai. While she didn’t go to Hawaii just to photograph foliage, it’s impossible to ignore that these exotic plants provide plenty of color, texture and interest, even before you notice that a lot of them also produce gorgeous blossoms. Cordylines and Crotons join palms in paradise. The “See the Light” workshop was based at the Hui Ho’olana (www.huiho.org), the former hunting lodge for the Cooke family, one of the most influential families in the islands from the mid 1800s. What started as a general store to supply missions grew to become Castle & Cooke, one of the “Big Five” corporations that dominated the Hawaiian economy for generations, until the Hawaiian Democratic Revolution of 1954 struck a fatal blow to the sugar cane and pineapple industries as striking labor unions demanded the same wages and benefits as their mainland counterparts. Lush tropical ferns lend soothing green. Molokai used to be the site of the best pineapples in the world; that is now long gone. The island remains largely undeveloped, and many, if not most, of the residents wish it to remain so. The Nature Conservancy and a foundation funded by Rikki Cooke and Dewitt Jones have purchased miles of coastline in an attempt to preserve the natural beauty and the habitats of the island’s native creatures. 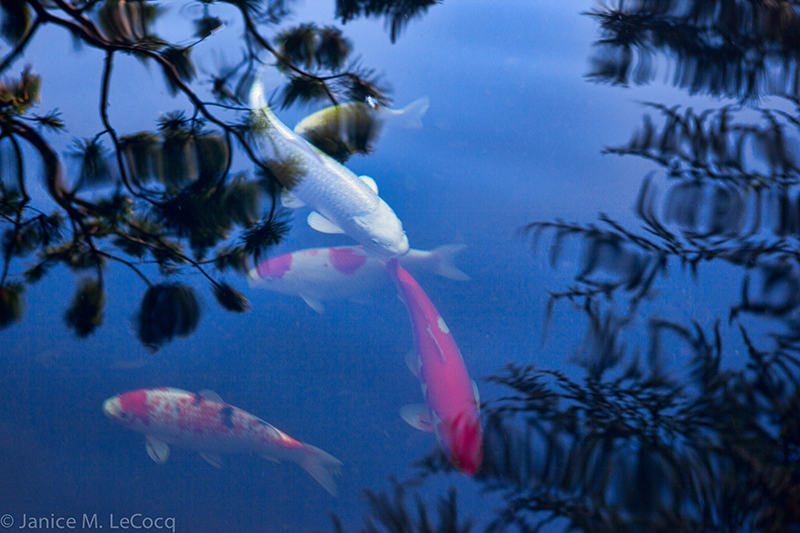 The gardens at the Hui are serene and lovely. This is Form and Foliage, Hawaiian-style! The Hui Ho’olana today is a non-profit organization that hosts educational workshops and volunteer residencies to support a self-sustaining facility and Hui’s native Hawaiian reforestation projects. The Hui has hosted photography workshops since the 1980s. Rikki Cooke and his wife Bronwyn manage the Hui. The lodge is rustic, but roomy and comfortable, featuring a wrap-around porch with stunning panoramic views of the island. The kitchen garden at the Hui Ho’olana, with a spot for a tired gardener to rest. The kitchen produces delicious meals, with many of the ingredients harvested from their extensive gardens and fruit trees. Miles of trails snake down the island, and with a little advance planning you can get an expert massage in one of the yurts nestled in the woods on the hillside. The Hui recently underwent a major upgrade of the landscaping. The gardens are filled with textures and colors. While the plants in tropical gardens are vastly different than their temperate cousins (most are not even the same genera), design and color principles are the same, and year-round interest is the norm. We don’t generally think about large shade trees in the tropics, but they can be just as architectural as in temperate zones. And although we wanted to showcase some of the foliage plants that Jan photographed, we couldn’t resist ending with a more classic Hawaiian shot. Aloha from Form and Foliage! No foliage but lots of form. Categories: Color combinations, Color Palette, Tropical | Tags: Dewitt Jones, foliage color combinations, foliage gardening, Hui Ho, Hui Ho'olana, Molokai, Rikki Cooke , tropical foliage | Permalink. 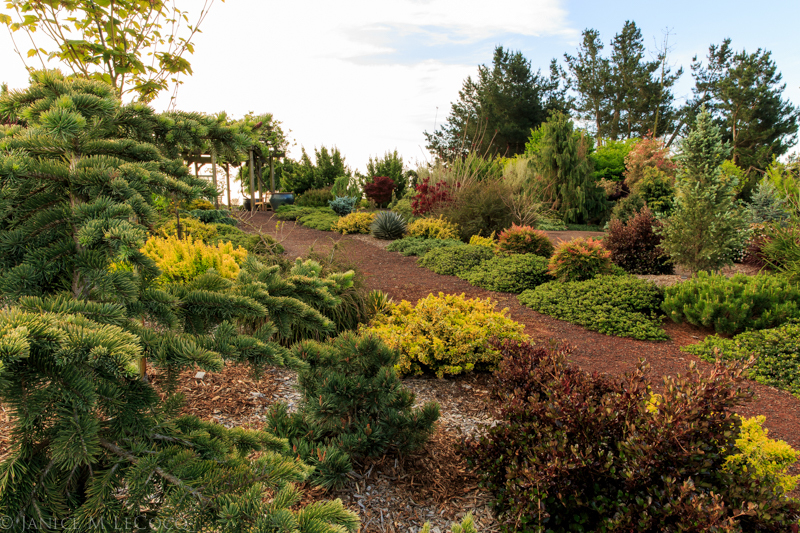 South Seattle Community College boasts not just an arboretum but also one of the best collections of dwarf conifers in the country. We’ve written about both large, grand public botanical gardens and small, private, intimate collections. 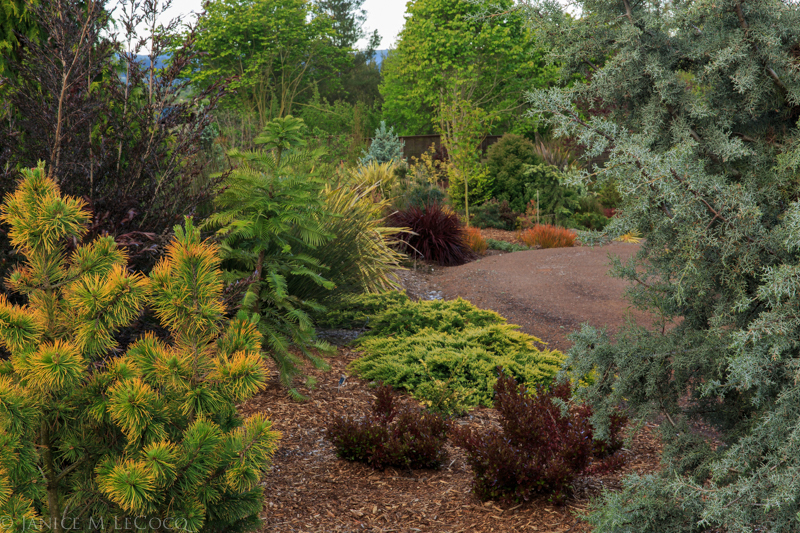 In Southwest Seattle, open to all visitors with no fee, is the newest American Conifer Society Reference Garden: the arboretum at South Seattle Community College, a public space designed and crafted with a personal touch. This arboretum puts many large-university offerings to shame, particularly its Coenosium Rock Garden, specializing in gorgeous dwarf conifers, such as the Picea abies ‘Gold Drift’ gracing the entry stone. The Coenosium Rock Garden was dedicated in 2005 and inducted into the Gardens for Peace program in 2010. 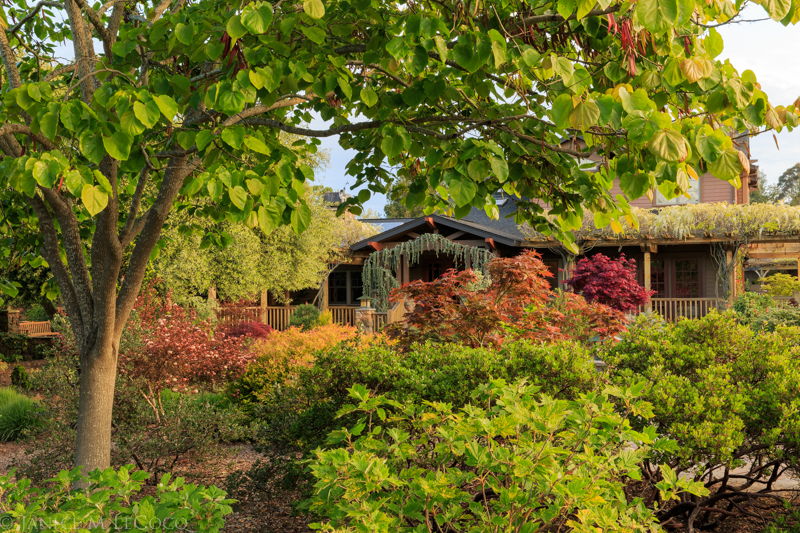 The arboretum was established in 1978 at the north end of the campus, after students in the landscape horticultural program petitioned for an outdoor laboratory. The present-day garden is about five acres and has a sweeping view of downtown Seattle. 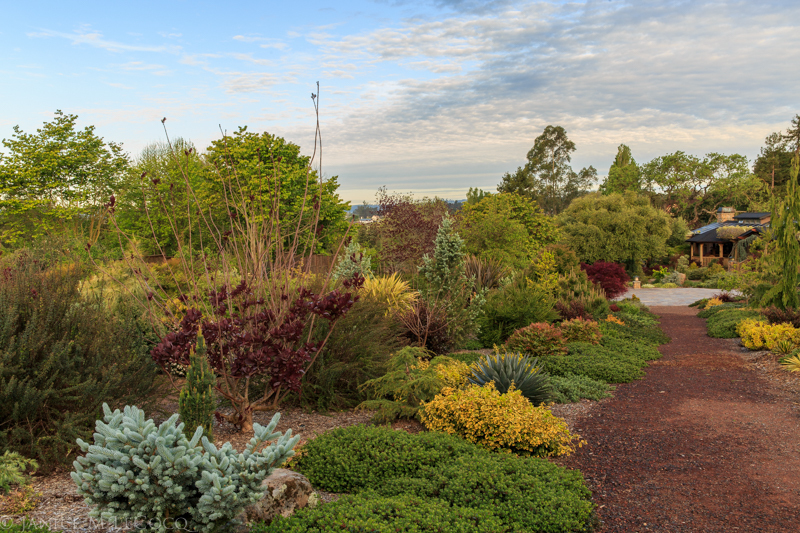 Although the arboretum counts its Helen Sutton Rose Garden as one of its highlights and there are robust examples of perennial borders, rhododendron and ornamental grasses, it is the two conifer gardens that drew our interest for their excellent displays of form and foliage. The Milton Sutton Conifer Garden opened in the early 80’s and now has some lovely mature specimens. The Milton Sutton Conifer Garden, planted soon after the arboretum was begun, has lovely specimens (and the best view of Seattle!) but is of more interest to the conifer-addict than a gardener seeking ideas about plant combinations, as it does not feature the attention to plant placement and design that characterize the newer Coenosium conifer collection. Cryptomeria japonica and Cedrus atlantica ‘Glauca pendula’ have nicely contrasting color and texture. Amongst the conifers in this part of the arboretum, though, we found plenty of color and textural variety. The Japanese ‘cedar’ (not a true cedar, but that’s its common name), replete with cones, on the left in the above photo, has distinctly different needles than the blue Atlas cedar on the right. Their colors, too, contrast pleasingly and their shapes are wildly different–the Cryptomeria stands about 40-50′ tall while the Atlas cedar drapes itself horizontally in numerous directions. 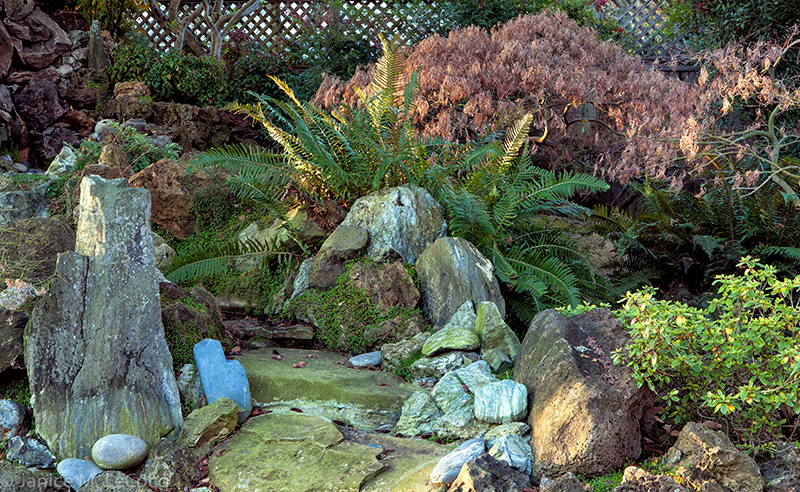 In the Coenosium Rock Garden, conifers dominate, with attention paid to design principles such as repetition and the use of companion plantings. The Coenosium Rock Garden was the brainchild and donation of Bob and Dianne Fincham of Coenosium Gardens, which we wrote about last year. Intended as a teaching tool and laboratory, it also functions as an attractive display garden, with careful attention paid to combinations of color, texture, shape and size. There are non-cone bearing plants sharing the space, from stately European beeches to humble black-eyed Susans, giving those looking for ideas much to see and inspire them. A busy road runs behind this lovely stand of European beeches, cedars and other conifers. The Rock Garden was begun in 2000, dedicated in 2005 and inducted into the Gardens for Peace Program in 2010. The site is problematic; much of the soil is heavy and drains poorly. The West end of the garden, which was planted as part of Phase I in 2000, required roughly 60 yard of fill before the 60 conifers and European beeches (which today are over 20′ tall) could be planted to make a screen along busy 16th Avenue SW. Most of us don’t use material in such large quantities but the principles are the same: poor soil can be amended and woody plants can be used functionally to create and delineate spaces. The deep purple leaves of the weeping European beech contrast beautifully with the surrounding conifers. Most of the non-coniferous plantings are European beeches and Japanese maples; both are long-lived, slow-growing trees with lovely shapes, bark, stature and leaf color and texture. 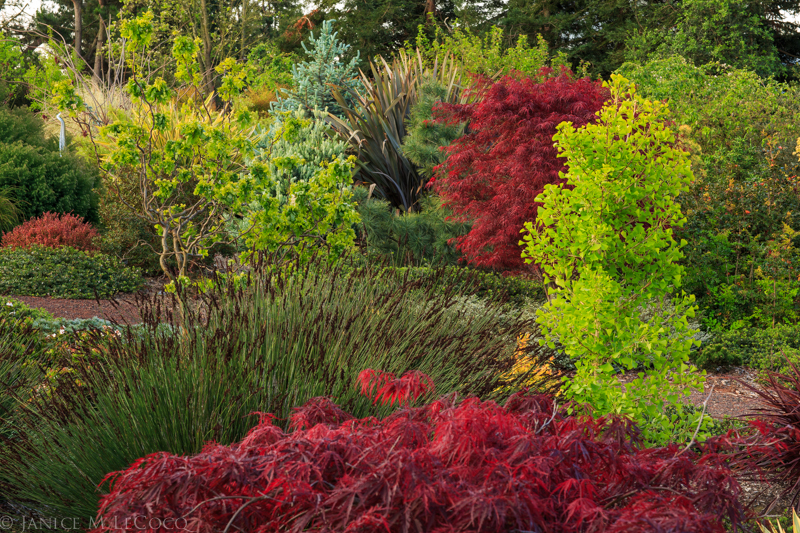 The glossy leaves of the beeches and the lacy maple foliage provide a pleasing contrast to the conifer needles, although this garden’s designers have taken pains to illustrate that all conifers are not alike. 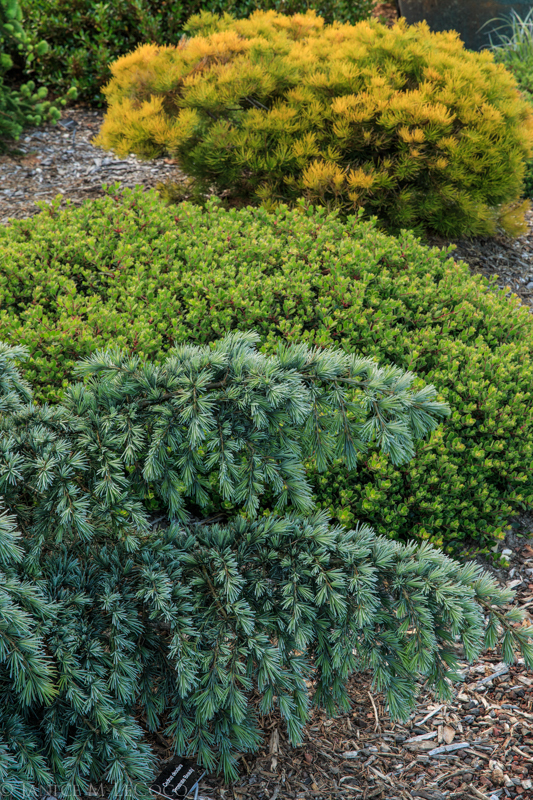 The lime green Calocedrus foliage and the blueish Picea needles couldn’t be more different. Likewise this grouping of a blue Atlas cedar, vibrant green false Hinoki cypress, tweedy loden spruce and rich emerald pine. We lingered in this garden for a couple of hours, partly because there was much to engage the eye, but also because Bob and Dianne envisioned this spot as more than just a laboratory, but also as a richer sensory experience, like most successful gardens. The garden includes a magnificent water feature, donated by the Arboretum Support Committee and designed and installed by SSCC students. 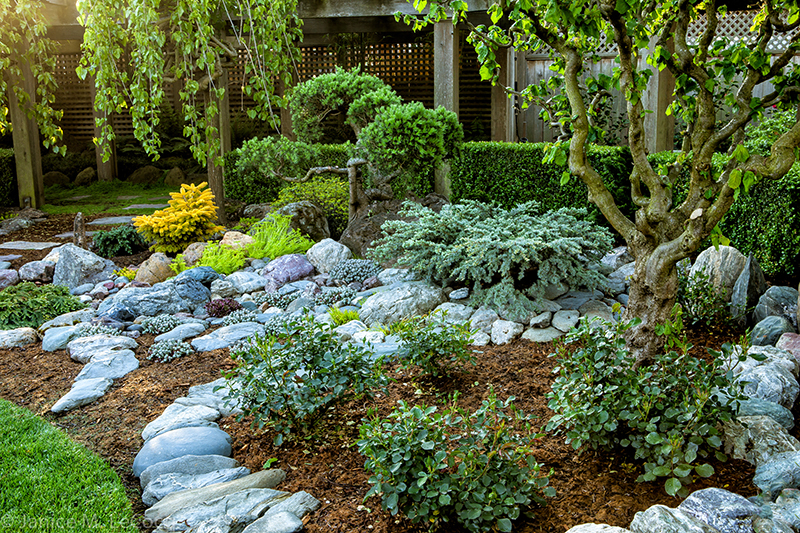 The pleasant sound of the water and textural richness of the stone creek bring sound and earthiness into the impressive collection of plantings. Rushing water moves through a rock-lined creek bed in the middle of the garden. And, like all good gardens, there are benches where visitors can sit and take it all in. Plan enough time when you visit to sit and enjoy the garden’s sights and sounds. Horticulture Instructor Van Bobbitt is the Arboretum Coordinator, and his students, in addition to using it as a living laboratory, maintain it for the pleasure of others. If you are in Seattle, don’t miss this lovely spot: South Seattle Community College Arboretum. Follow the Arboretum on Facebook. Categories: American Conifer Society Reference Gardens, Coenosium Gardens, Color combinations, South Seattle Community College Arboretum | Tags: American Conifer Society, conifers, evergreen shrubs, evergreens, foliage color combinations, foliage gardening, garden design, plant selection, South Seattle Community College Arboretum | Permalink. Because of our passion for plants, we tend to focus on gardens that feature collections of specimens and stretch our imaginations devising pleasing and provocative combinations of colors, textures and shapes. Sometimes, however, the strongest statements come from the deft use of massed plantings and fundamental color and design principles. Paul and Paula’s garden is a beautiful example of keeping it simple without sacrificing interest or sophistication. And in best form and foliage fashion, this garden shines through the fall and winter months as well as spring and summer! Despite the unfettered design, much care went into its conception and the selection of the plantings. Paula, who has an artist’s training and sensibilities, chose the Loropetalum to border the path because she wanted to echo the tones of the brick with a complementary plant that was appropriately sized and attractive year-round. The decision to use deep reddish-purple against the brick was daring; most of us think ‘red’ when we think of brick, but the purple brings out the rosy tones. Also, most of us would have not been able to resist the urge to plant a jumble of different colors and textures; Paula’s confidence in the essential design principles of repetition, scale and color harmony allowed her to resist that temptation! 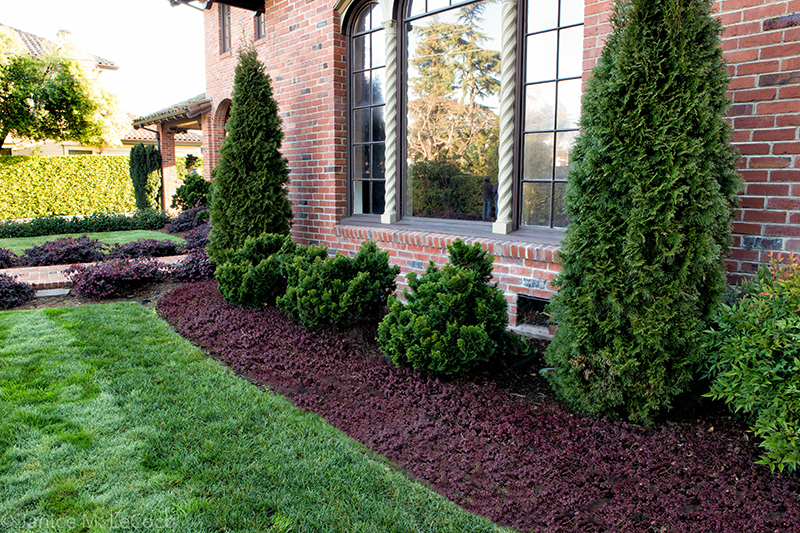 The distinctive purple of the Loropetalums is repeated in the carpet of Sedum ‘Voodoo’ around the foundation plantings of Chamaecyparis obtusa cultivars. 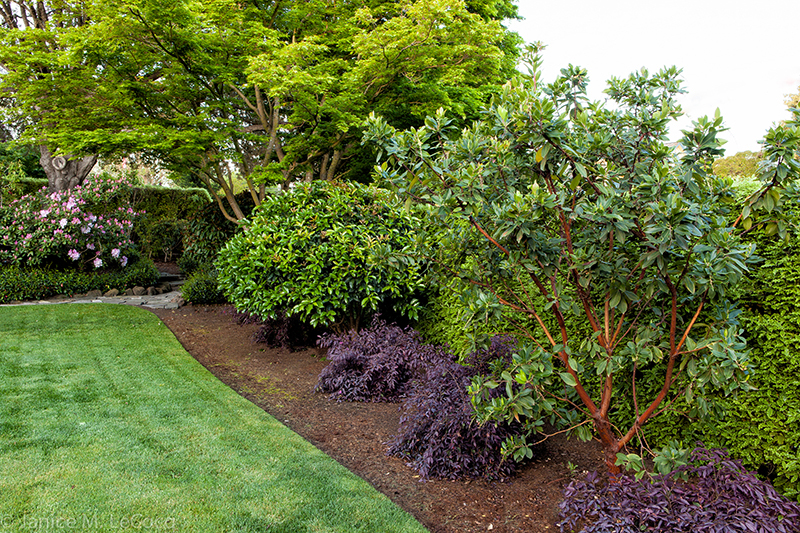 This is horticultural ‘color blocking’ with rich, deep tones, and the repetition of the purple and green makes for a unified design. 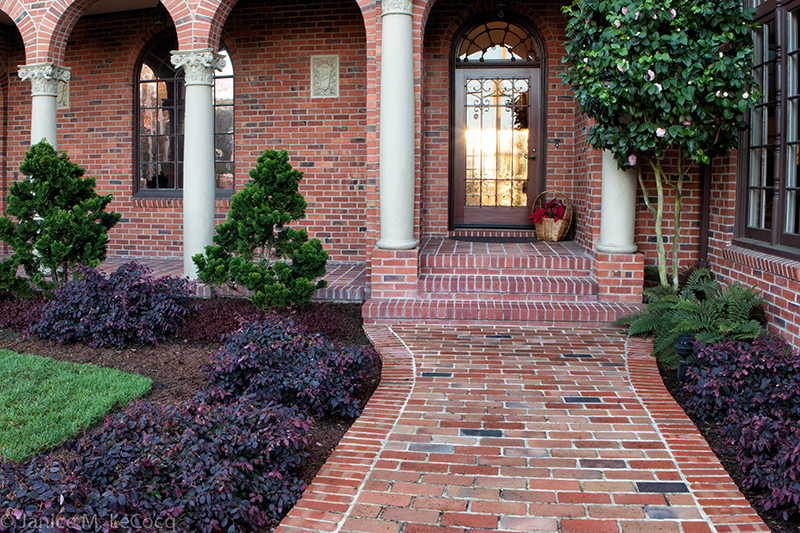 While respecting the formal lines of the brick house, these plantings also soften, enrich and complement it. 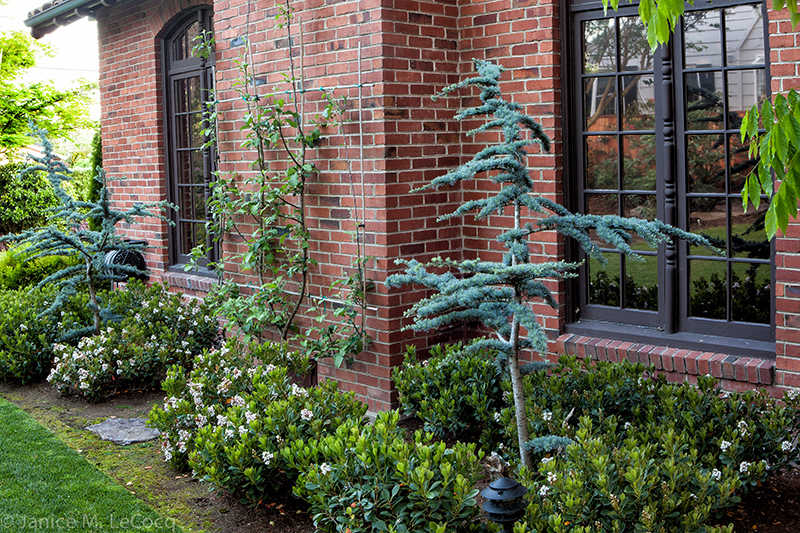 On the side of the house, Paula used more mass plantings of evergreen shrubbery and chose two Cedrus libani var. atlantica (Atlantic cedars) as focal points. Those of you that read our post on Color Scheming will recognize that the purple/brick combination represents an analogous color pair, while the blue/brick is a complementary combination. That’s why the cedars are edgier and demand more attention, and their skirt of shrubs is correspondingly subdued. The brick borrows tones from the adjacent plants, appearing rosier next to the purple-leaved Loropetalum and more orange next to the blue cedar. Note the crisp edging and the clean lines of the multi-trunked trees (an Acer palmatum cultivar on the left, Arbutus ‘Marina on the right). The planted are sited to ‘let the shapes show’ and their structure is as important as their colors and textures. In this bed the Loropetalums function as punctuation and connect it to the walkway and foundation plantings. 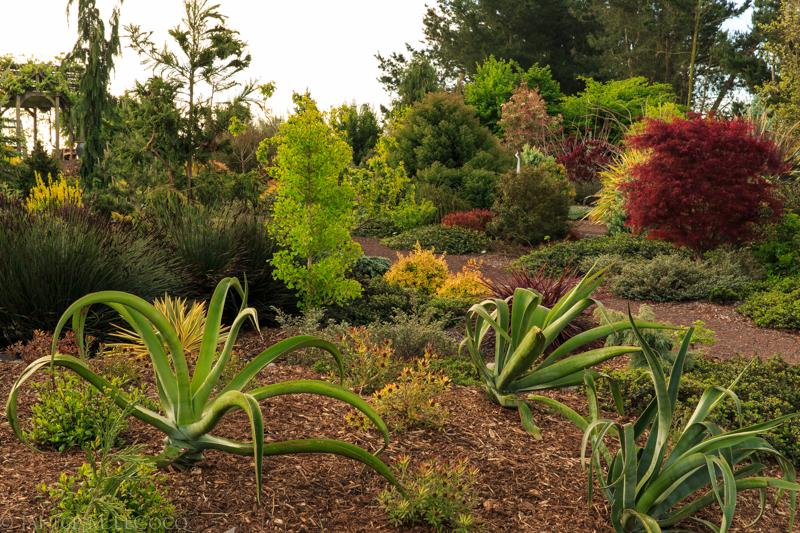 The rich jewel tones are repeated throughout the garden, with different plant combinations. 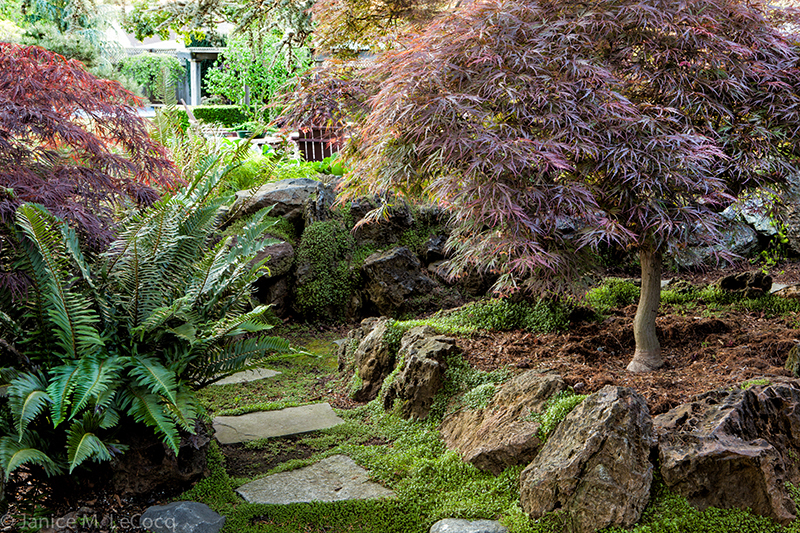 The Japanese maples and ferns adorn the wooded side yard that is shaded by towering Atlantic cedars and oaks. 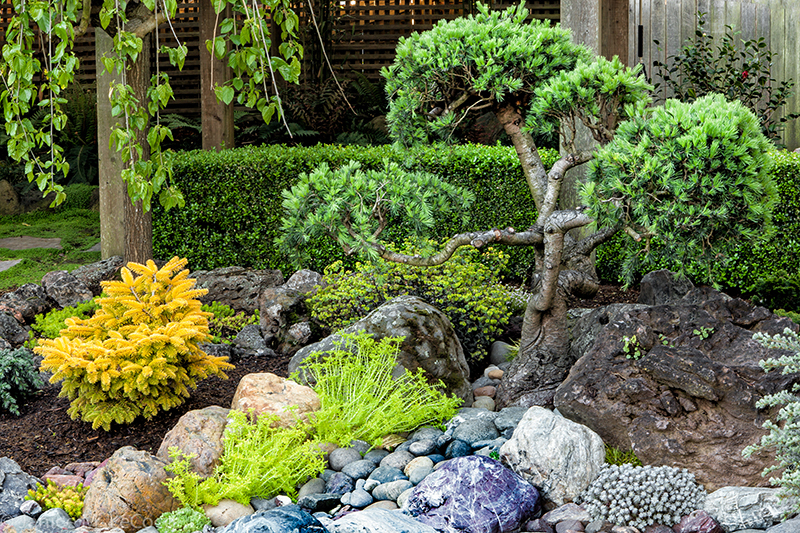 By varying the plant materials but sticking to the color scheme, the different areas of the garden are connected and unified. The overall sensation is one of serenity; the simplicity of the design is in itself relaxing and the choice of colors reinforces the calmness. We like to say that sometimes the best plant for a particular spot is a stone…and Paula repeats the blue of the cedars with specimen stones. The combination of purple, icy blue and rich green now has many textural components that continue to be unified by color and simplicity. The stones also echo the structural lines of the woody plants and provide interest throughout the year. The latest project is a rock garden at the back of the property with newly planted roses, succulents and a few specimen conifers, anchored by a pair of mature Corylus avellana ‘Contorta’ (Harry Lauder’s walking stick, one of which can be seen on the right side of the photo). Here purple gives way to accents of brilliant gold and chartreuse, and when the plantings spill over the rocks this will be the spot in the garden where the formality eases a bit, as it is away from the house and can set its own tone. We look forward to visiting the garden again when the plantings around the rocks have matured and provided the cohesiveness that Paula intends. Although this spot is across the back lawn from the house, the brilliant Caucasian fir ‘Golden Spreader’ shines like a beacon and calls the eye. Another design principle that Paula has employed: light, bright colors project, dark colors recede. The strategic placement of one golden plant draws attention to the entire bed. While Paula works with plant selection and design, Paul tends the Koi pond that not only provides pleasing sound and interest, but reflects the branches of the specimen trees. We came away from Paul and Paula’s garden feeling relaxed and as if our blood pressure had dropped a notch. Isn’t that a wonderful gift for a garden to bestow? Categories: Color combinations, Color Palette, Design philosophy, Paul and Paula's Garden, Spring | Tags: color theory, color wheel, evergreen plants, foliage color combinations, foliage plants, garden design, japanese maples, woody shrubs | Permalink.